Instrumentation: C Trumpets 1 - 3 Bb Trumpets 4 - 7 Bb Trumpet 8 doubles Bb Piccolo Trumpet. 5 players use Straight mutes (1, 2, 3, 4, 7); 4 players use Cup mutes (4, 5, 6, 7). A Harmon mute for the Piccolo trumpet is optional. 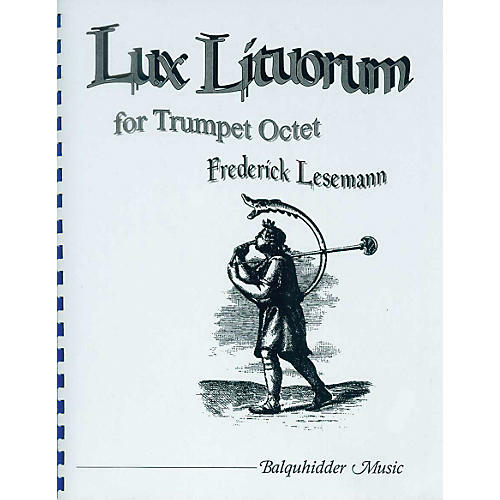 Duration: 7' 15 Lux Lituorum might be translated as Light from Trumpets or perhaps Trumpets of Light. It is from the Latin Lituus, a Roman ceremonial lip-reed instrument in the shape of an elongated J seen in formal depictions of ceremonial occasions. The piece was composed in February - April 1996 for performance at the 1996 Convention of the International Trumpet Guild in Long Beach, California. It is dedicated to the University of Southern California Trumpet Ensemble and its director, Boyde Hood.